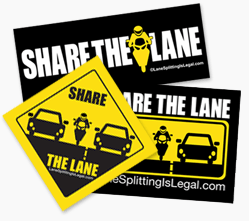 AB236, Nevada’s lane splitting bill, has passed the Senate Transportation Committee. The bill was first heard by the Nevada Senate Transportation Committee on April 26th. The bill was then amended to allow lane splitting only in stopped traffic, at no more than 10 MPH and passed the Senate Transportation Committee in a follow-up work session May 17th. It will now go on to the full Senate for a full vote. As covered in our previous coverage of AB236, the bill originally allowed for splitting up to 30 MPH, at not more than 10 MPH faster than surrounding traffic. The original bill and support, if passed, looked to be an excellent template for other states to follow. This new, extremely limited form is similar to Oregon lane splitting bills SB541 and HB3310 – both of which appear very unlikely to see any progress. Check out the amended text of AB236 below. Both Daly and Adler added air cooling the rider to the old “lane splitting helps with air cooling” argument. Las Vegas Metropolitan PD was again represented by Brian O’Callahan. LVPD is neutral on AB236, although the Nevada Highway Patrol has spoken negatively of the bill in the media – surprising, given the California Highway Patrols’s support of lane splitting. And here’s the where the amended AB236 passes the Transportation Committee in very limited form. The progress of AB236 has been widely covered by the mainstream media. TV news shows are running news segments on AB236 and lane splitting, and SF Gate and many other online news outlets are picking up a stories on AB 236. Stay tuned here, like us on Facebook or follow us on Twitter for the latest information on AB236 and other lane splitting legislation. Why is this surprising? Do we expect all law enforcement agencies to have the same opinions on issues? Is LVPD’s neutrality not also surprising? The Bill has been amended to lessen the intent of the bill which was to allow lane sharing, splitting and filtering when traffic becomes congested and moves at a very slow speed. The original language allowed motorcycles to move through very slow traffic when the traffic moved no faster than 30 mph with the motorcyclist moving no faster than 10 mph above the speed of traffic. This amendment was poorly conceived and the process of lane sharing, splitting, filter poorly understood by the Senators. Agreed – it was a poorly conceived amendment. However, it’s now been defeated.